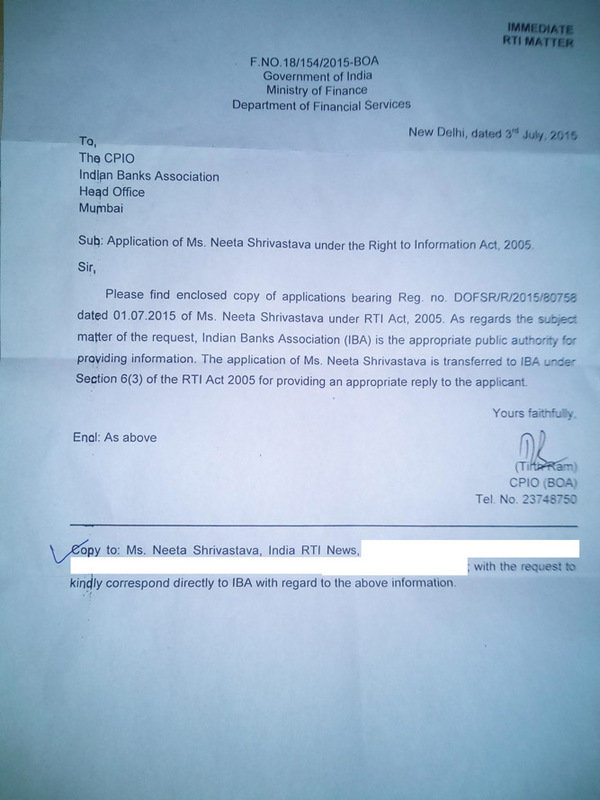 Want to apply RTI application to Indian Bank Association then use this trick .If you will apply directly then IBA willreply that it is not public authority, but IBA is responsible to Ministry of Finance. Apply online or physical application to Prime Minister Of India Office(PMO). PMO will transfer it to Ministry Of Finance and later Ministry Of Finance will transfer it to IBA Mumbai. Please see Ministry of Finance letter in picture. The CIC has decided that IBA is not a Public Authority as defined in the RTI Act. With reference to the decision of this Commission dated 30.1.2008 in relation to the application of the appellant dated 21.3.2007 seeking information from Indian Banks Association, I had reserved the decision as to whether Indian Banks Association is a public authority or not with the direction to IBA to furnish various information, like the nature of the organization, how the same was being funded, the composition of its membership and its mandate for settling disputes and entering into agreement with workers etc. Accordingly, IBA has furnished certain information, like, annual report etc. From the details furnished, I find that IBA is a voluntary association of Banks. Its membership comprises of 150 member banks- public and private sector banks, foreign banks, financial institutions and cooperative banks. Only 28 out of 150 members, are public sector banks.. The entire expenses of IBA are found to be proportionally borne by the members. Even the members of the Management Committee are found to be elected representatives of the Member banks. It is also seen that on the basis of the authority given by the member banks, IBA negotiates with employee organization on behalf of the banks. Thus, I find that the Association is neither substantially funded by the government nor it is under the control of the government. Therefore, I find that IBA does not fall within the definition of a public authority as defined in Section 2(h) of the RTI Act and accordingly I hold that IBA is not a public authority.